Make sure the CBD you use passed our tests and is right for you! CBD (cannabidiol) has become popular despite the fact that the FDA has stated it cannot legally be sold as a supplement. There is preliminary evidence that it can help reduce seizures, and may help for anxiety and insomnia. It can be hard to pick the best CBD oil because product labels often don't list what they contain and, even then they do, many have been shown to be wrong. To help, we purchased and tested a variety of CBD oils and hemp extracts for people and pets. Our tests of CBD products revealed that two products contained less CBD than listed and one contained significantly more. Actual doses ranged from just 1.3 mg to 22.3 mg, and we found that you can't rely on listed amounts of "cannabinoids" to tell you how much CBD is in a product. We also found that the cost to obtain an equivalent amount of CBD (10 mg) ranged nearly 6-fold from 80 cents to as much as $4.54 (and $4.73 when including lotions and balms). In addition, we checked for contaminants (arsenic, lead, and cadmium) in all products. Products that were the best quality and best value were chosen as our Top Picks. On top of everything else, we tested each product for THC, the psychoactive compound in hemp. You must be a ConsumerLab.com member to get the full test results along with ConsumerLab.com's Top Picks and ConsumerTips on how to choose and use CBD. 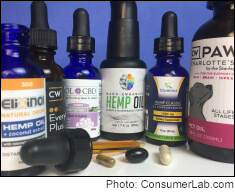 You'll get results for 19 popular CBD products (including oils, capsules, lotions, balms, and two specifically for pets) including 14 selected by ConsumerLab.com based on reader requests and five tested through our voluntary Quality Certification Program.